LIKE their counterparts in almost all of Asia, Philippine companies were struggling to survive during the financial crisis that hit Asia in 1997. It was during this time when the holding company of DMCI Homes ventured into real estate to liquidate the company’s assets and not to become a major player in the industry. The Consunji family, who owns the holding company and has a 50-year experience in the construction industry, felt they “could construct a building and sell it.” The first years saw an experimental phase for DMCI with no particular target in mind. In 2006 the holding company realized there was an opportunity and had enough resources that it decided to seriously venture into the business. It started purchasing available property around and outside Metro Manila, getting a professional team and putting science into it. Almost 15 years after its conception, DMCI Homes—now widely known as a vertically integrated property builder-developer—has launched close to 50 projects, or 36,772 residential units; is serving the upper-middle income class; and is one of the key players in the real-estate industry. DMCI Homes’s exponential growth started in 2008. “At that time, instead of doing just one or two projects, the company was already doing five projects simultaneously,” said DMCI Project Developers Inc. Chief Finance Officer Joseph Lombos. After completing his Bachelor’s Degree in Engineering Management with Latin honors at the University of California Los Angeles, Construction Course and Masters Degree in Business Management at the Asian Institute of Management and Total Quality Management Training at the Tokyo University, Lombos proceeded to apply and broaden his expertise locally and in various multinational banking companies in the US. Lombos, who has been with the company since 2010, believes the success of DMCI Homes can be rooted in the DNA of the company owners. “The Consunjis are very simple and realistic, and their decisions are always based on their experiences and on what the clients want and need,” he said. 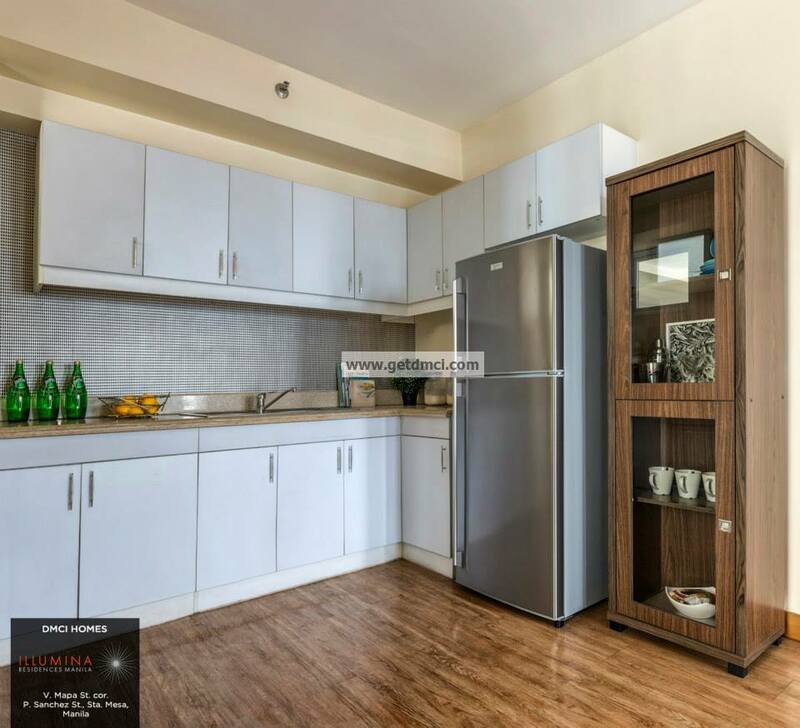 For instance, the kitchen should be big because mothers love to cook, and this is reflected in DMCI Homes’s units, among other family-oriented concepts, such as two-bedroom units. The DMCI Homes executive believes the price also helps. 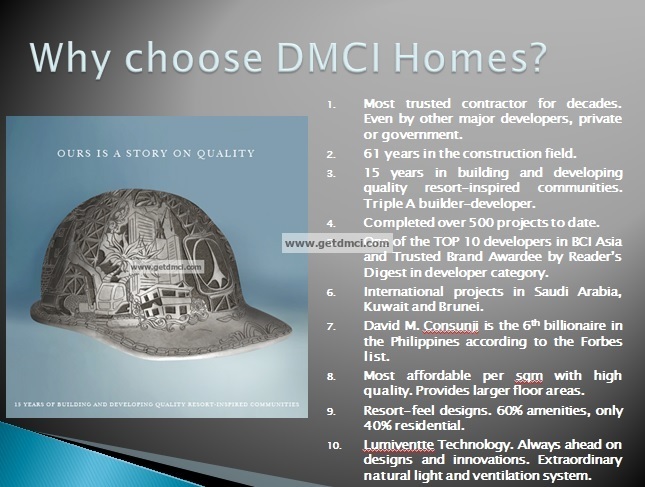 To date, DMCI Homes is the only property developer and constructor in one, unlike others which have a subcontractor. This strategy brings about lower production costs, allowing the company to sell the units at a lower price. “The Consunjis’ 50-year experience in the construction industry and sensitivity to the needs of families translates well to premium, quality and yet, affordable products,” Lombos said. “VERTICAL living options have become more desirable for families that dream of an urban lifestyle in a semi-self-contained urban community,” Lombos said, adding that existing and emerging central business districts, traffic and gas prices are a big consideration for developers and clients alike. He also said there is also a growing demand for real estate—both vertical and horizontal developments—outside Metro Manila, especially in cities like Cebu and Davao, and these are due to several factors. LOMBOS said competition is still high in the industry, which has been in its best position in the last three years. The affordable-housing segment expanded and the luxury-housing segment increased due to the strengthening purchasing capacity of the market. The banks also played a role as they are being cooperative in terms of offering good rates, which means there are funds in the end of the developer to finance projects. “All these can be attributed to the recent macroeconomic growth brought by the positive investor segment, stable BPO [business-process outsourcing] industry, and high and growing OFW [overseas Filipino worker] remittances,” he said. “I think it will still continue until next year, as long as interest rates are also stable,” he said. The Bangko Sentral ng Pilipinas recorded this year the lowest interest rate of 5 percent because of the liquidity of the banks. To better facilitate the flow of the economy, lower interests must be had for the banks to attract borrowers. Lombos sees the industry continuing to expand, given that several investors are working on the Manila Bay reclamation area developments and several urban centers within Metro Manila, offering office and residential developments and addressing the demands of the BPO industry. Despite this positive outlook, Lombos foresees that the industry may go down in two years. He added that banks have also learned from the previous crisis by not offering too much development loans to developers. Moreover, Lombos expressed the belief that the government has a big role to play in the development of the industry. “Only time will tell if the real-estate industry will be sustained 10 years from now,” he said, citing a government study of housing demand that stated there is still a big percentage of Filipinos who do not have their own houses. “If the government is really committed to develop the infrastructure going outside Metro Manila, fix the airport and have it in Clark, and make the available lands outside Metro Manila accessible, the real-estate industry will benefit from that,” Lombos said. “I hope the government can deliver its commitment. “As for DMCI Homes, which is not publicly listed, there is less pressure compared to those which are publicly listed. While others promised profit in the next five years and are committed to keep developments coming no matter the economic landscape, DMCI Homes is prepared and will only have to make sure that the company remains intact,” he said. “We are here to stay for the years to come, and we will just continue being focused on our market as we have always been,” he said.